GORDONVILLE – The other night I was doing what it is I do, pecking away at something or other on my laptop when Sofia came over, looked at the screen and asked what I was writing about. I told her – honestly, I can’t remember now what it was (I believe lyrics to a Mellencampesque new song “Every Character Has An Arc,” but don’t quote me on that) – and she filed a request. She wanted me to write about her this week. As my longtime readers know, I always honor Sofia’s request. And writing about her has never been a problem. She is the best muse this “writer” could ask for. And what’s the point of being a father to a little princess if she can’t be a daddy’s girl, right? I promised her I would. After all, it had been a while, and there is as much going on in Sofia Land as there is in Gordonville worthy of reporting. But the best I can do is issue a rain check to Sofia and her fans out there. I will honor her request, and keep my promise, but I can’t do it this week. And I say it as a father – a father grateful to be in the enviable situation of kissing her goodnight every night. This week, I want to speak for all the fathers — and mothers — who were deprived of the chance to live my charmed life as Sofia’s daddy. Lest we not, amid the barbecues and holiday sales, forget that the reason we have a long weekend is not the unofficial start of summer and the reason to open pools and begin playing American Legion baseball. 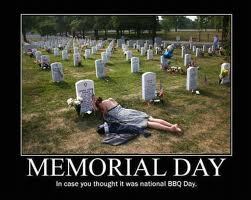 It is because it is Memorial Day. By definition, it is a day to remember those who gave their lives so that the American dream – unfulfilled as it is for many – can endure. We, as civilians who never served in the US Armed Forces, cannot pretend to know or understand what it is like to be in battle. We don’t comprehend the guilt of being alive while your comrades in arms are not. But that doesn’t mean we can’t try a little harder to be less cavalier about what should be regarded as one of the most solemn of the non-religious holidays on the calendar. That’s really all we can do, and we should do it because that’s what they – the dead and those who mourn them the most – deserve. The holiday was born in the wake of the brutal Civil War, with many towns – North (Boalsburg, Pa. has the best claim) and South (Savannah, Ga. is chief among them) – claiming to be the first to decorate graves with flowers. Known as Decoration Day, it was symptomatic of the lingering ill-will in the country at the time, as it was not uncommon, for example, for people in the South to only adorn the graves of Confederate soldiers while “freedmen” (former slaves) would decorate those of Union soldiers. As the country evolved into the 20th Century, and through World War I and World War II, Decoration Day became Memorial Day and more civic events, like parades and well-attended ceremonies at cemeteries were common. As we descended more into our current me-first culture, those events were dwarfed by sales and going to the beach and holding cookouts. The other night, we were in the gift shop of the Cracker Barrel in Plymouth Meeting (Sofia, of course, always gets a toy of some sort – usually a doll — after whatever meal it is). I spotted something curious in a whole over-the-top, proud-to-be-an-American section. It was a book, I believe, stating that there are no agnostics – or maybe it was atheists — in foxholes. Being an agnostic/borderline deist, and an American who takes the whole freedom of religion deal seriously, I could have taken offense. I get the point, over-simplified – and agenda-driven — as it may be. In foxholes, or places like them, a lot of pettiness is gone with the wind. The things that divide us on the home front – politics, geography, race, religion – surely seem ridiculous to those facing death. And if someone who survives believes some divine intervention was involved, so be it. I wasn’t there, they were. If it makes those who survive better people – better Americans – then we are all better off. And it is our responsibility – one day a year – to help them remember those who didn’t make it out of the foxholes of Europe and jungles of Asia and mountains of Afghanistan. Sofia and I have a springtime ritual of adorning the yard with our trinkets that spend the winter in the garage, near the door, waiting to sing in the sunshine. Because this happened to take place Saturday, we also used the occasion to put out the American flag (yes, Democrats do that, too) and decorate the yard with smaller ones. It seems a bit banal, and only scratches the surface of understanding, but I feel like I’m doing my part in helping a 6-year-old understand that there is more to the holiday than catching a sale at Kohl’s or Macy’s. I hope she also understands why I couldn’t immediately honor her request to write about her. This entry was posted in Politics on August 14, 2013 by gordonglantz.